The extremely picturesque Yumthang Valley is situated at an elevation of 3564 m in the North of Sikkim. The place is amongst the most famous tourist destinations in Sikkim, popularly known as the ‘valley of flowers’ because of its unique location above the line where no trees grow. The shrubby slopes of the snow-clad mountains around the valley, the long stretches of land covered with flowery meadows and the scented environment makes this place a nature's wonderland that attracts many tourists from around the world. 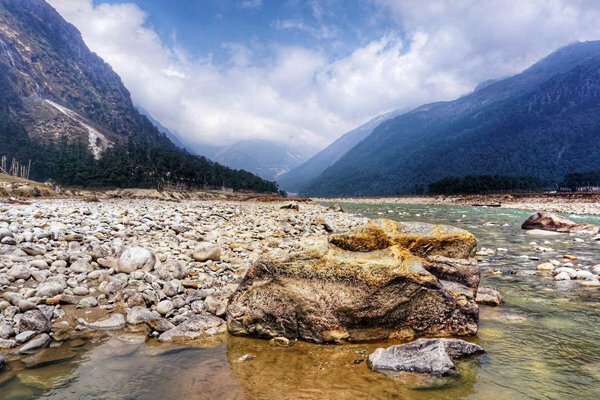 The valley is the vantage point for the beautiful peaks of Panhunri and Shundu Tsenpa forming an amazing scenic setting for the gushing Teesta river. The grazing yaks amidst thousands of blooming Himalayan flowers and an astounding collection of Rhododendrons entice the visitors to stay for a little more time. The Yak ride is something one can never miss on their visit to Yumthang valley. Near to this are the two well-stocked rivers for the anglers; Yumthang chu and Puniya chu. And just about 7-8 km away there is very impressive Shingba Rhododendron Sanctuary which has a 35 square km large field that has over 38 different varieties of rhododendrons. On the way to the Yumthang Valley, there is a hiker’s pathway that leads to a small bridge reaching the Yumthang Hot Spring. The surprising factor about this place is that even in the coldest weather, the water flowing from this remains warm. And it is believed to have medicinal value of healing because of it’s rich sulfur content. About 7 kms further to the north of the hot spring, there is a very famous Shiva Temple. Zero Point which is around 23 km away from the Yumthang valley at an altitude of over 15,000 ft, very close to china border, is another very popular destination among the trekkers because of its immense scenic charm and unobstructed view of the snowy peaks. One can hire a taxi from Lachung which is just about 26 km / 49 mins of drive away from the Yumthang Valley. The road reaching to this valley offers the spectacular view of the field of varieties of rhododendrons on both sides. Due to its proximity to China border, even this place requires an inner Line Permit, which can be obtained from the Tourist Information Center or through any registered tour operator. The best time to visit place is definitely during summer between April and May, because of its high altitude. As during winter, snow makes this place dangerous to reach and also unbearably cold. Same is the case for the rainy season.